Ingredients: lingonberries, sugar, lemon-juice concentrate. Gellant: pectin. It is much much better than Preiselbeeren konfiture from IKEA, but still not the homemade kind. Preserve Wild Lingonberry 400 gr. 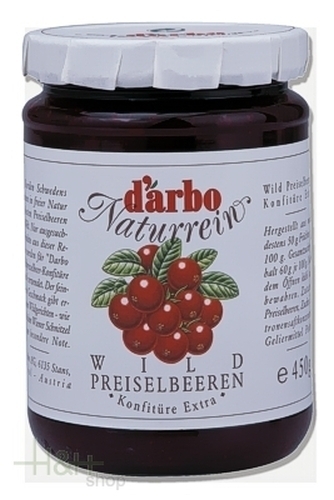 - Darbo All Natural 4,95 EUR / 12,38 €/kg. Preserve Finely-sieved Strawberry 450 gr. - Darbo All Natural 4,70 EUR / 10,44 €/kg. Fruit spread strawberry sugarfree 220 gr. Lerchnhof 6,95 EUR / 3,16 €/100 gr. It is much much better than Preiselbeeren konfiture from IKE ..